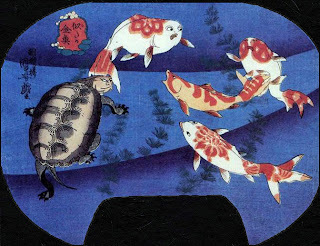 Eureka's warrior frogs and turtles were inspired by the ukiyo-e of Kawanabe Kyōsai. Kyōsai in turn was influenced by his master, Utagawa Kuniyoshi, who depicted his human subjects as animals to get around censorship laws, as in the case of the actors shown below. I thought Eureka's terrapin warriors would match well with the ERM frogs mentioned in my previous post. The first five terrapins are Terrapin, with spear (100FRG17). 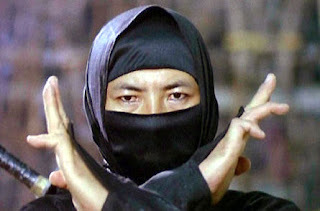 I modified one of these terrapins by cutting away its spear and gluing some pins in its hands to represent drumsticks. The arms and head were bent so that it could be paired with the terrapin carrying the drum from the Turtle/Terrapin Drummer Team (100FRG18). The final terrapin holding the forked stick is from the Turtle/Terrapin sniper team (100FRG16). The terrapins are supplied with separate shells at random, so you may get the larger turtle shells for your terrapins. I placed one of the turtle shells on the terrapin with a forked stick. It didn't look too bad from the front, but from the rear it just looked wrong. Happily, Nic at Eureka was kind enough to send me a replacement terrapin shell. 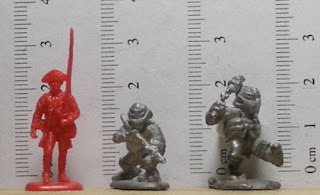 The next miniatures were also inspired by Japanese culture, but rather than ukiyo-e, they were influenced by 80's ninja films and superhero comics. They are of course, the Teenage Ninja Mutant Turtles. Shown below are Donatello and Michaelangleo. I think that Leonardo and Raphael may have suffered a horrible fate involving a hammer and lighter, but my memory is a bit hazy about it. 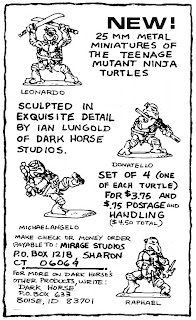 These miniatures were made in 1986 by Dark Horse Studios, and sold through adds in the back of the TMNT comics. The Eureka and Dark Horse turtles compare well to each other in size. Finally, for normal turles, there is the turtle from Reaper's Familiar Pack V (2848), and a pair of Galápagos giant tortoises from an old Noah's Ark playset made by Marx Toys. Another fun post! I never know what I'm going to see when I check out the Multiverse! Thanks for the words Chris. 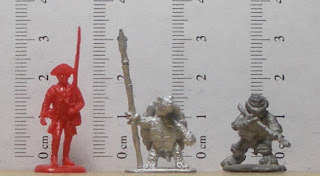 I've been buying off-beat miniatures so that my kids can have more fun when they put together their warbands for Song of Blades and Heroes. I guess that there's nothing quite as entertaining to children as fights between cute anthropomorphic animals.